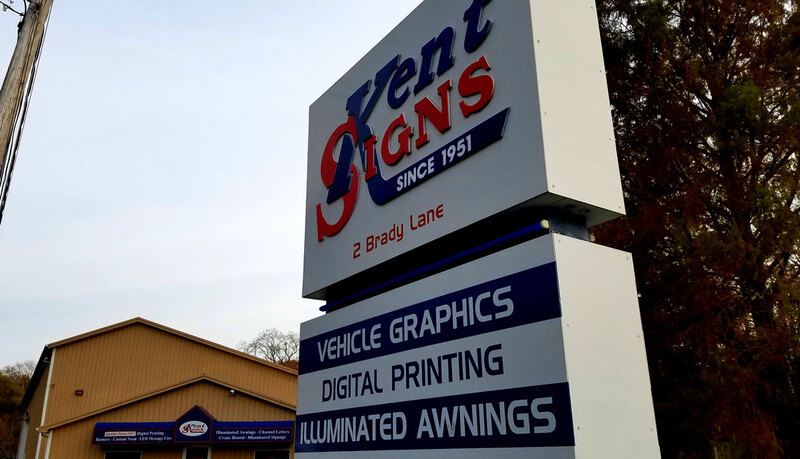 With over 60 years of signage experience, Kent Signs’ expertise spans a wide range of areas in the signage industry for both private and public sector organizations. We transform your ideas, passion and vision into creative artistic displays that express a thousand words in a brief glance, leaving an immediate and lasting impression in the minds of any passerby. An awning or overhang is a secondary covering attached to the exterior wall of a building. You can select from a variety of canvas woven of acrylic, cotton, polyester and other materials at your selection. A banner can be a flag or other piece of cloth bearing a symbol, logo, slogan or other message you desire. We can help you achieve a high-quality creative banner that will represent your organization in the best possible light. Channel letters are custom-made metal or plastic letters commonly used in exterior signage on public and commercial buildings and are often internally illuminated. Our team can help transform your building and bring it to life. With our custom signs we give you control over colors, images and text allowing you to fully customize your own durable sign for your home or business in a size that fits well with the layout and dimensions of your space. Communicate more effectively by deliver vibrant, eye-catching messages to your customers on large, digital electronic signs sometimes called Variable Message Signs. These signs can overhang or appear along major roads and highways or be displayed in restaurants or saloons, coming in either monochrome or full color. Our digital printing gives you a method of printing from a digital-based image directly to a wide variety of media. Any design you can create on a computer can be transformed into a file and printed any size you like using laser or inkjet printers. 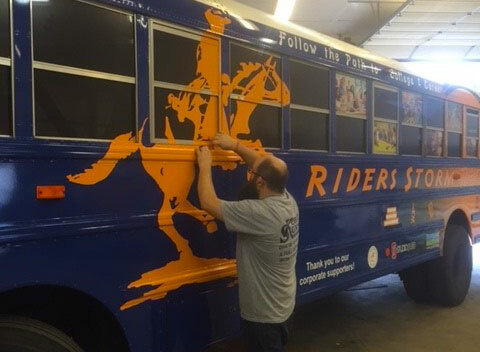 We can help transform your vehicle with prestigious and official looking decals, graphics or wrap work. Our professionals are equipped to handle Emergency Medical Technician, Fire & Rescue, Police and Law Enforcement and other First Responder Fleet vehicles. Whether you are looking for monochrome or full color, indoors or outdoors, in any size or dimensions, we can create the sign for you. Sometimes called Electronic Message Boards, our large energy-efficient, low-maintenance LED displays are highly visible. Add some spice to any space with this electric sign that is lighted by long luminous gas filled discharge tubes. We can create signs in many fonts, colors and sizes for a wide range of possibilities. We can ensure you get noticed with the name recognition you deserve to help customers find you day and night. Our high elevation, high visibility monument signs will get your company high exposure. Looking for a way to take your show on the road and make your brand stand out? We can help you completely or partially cover your vehicle in custom advertisement wraps. Our Routed Signs can be constructed from PVC, HDU high density foam, wood, acrylic, or avonite solid surface material. Get the high-quality high definition, long lasting, high durability one of a kind 3-D work of art you’ve been looking for. We can give you a durably fabricated economical letters sign solution that’s injection-molded and formed with razor-sharp edges and corners, and available in a wide variety of fonts. Get an outdoor lighted sign for your storefront and increase its visibility and readability with flat, panned and embossed face types. It’s a great way to catch the eye of passing vehicles and increase your night time visibility.